Solid, Natural, Artisan Perfume in a golden tin. Choose your scent from the Scents and Essential Oils link. Custom blends are also available. Ask me. Solid Artisan Perfume is made with a custom blend of almond oil, mango butter, jojoba, soy wax, coconut oil, essential oils or fragrance oils. Each blend is hand poured into a ½ ounce golden tin. It is just small enough to fit in your bag, backpack or pocket to use anytime and anywhere. Just slide your finger across the top of the perfume and swipe on the skin where you want to apply the scent. Can be used as often as needed. All perfumes are lovingly made right here in Palm Springs, California. I make these in small batches so they are fresh and to ensure quality. then write me a note on which scent you would like in the comments section of the shopping cart. 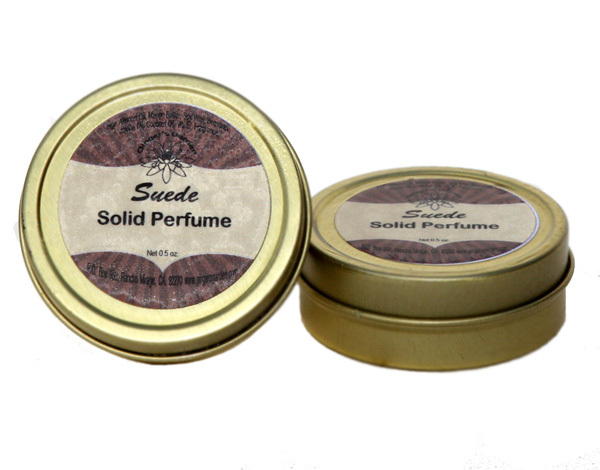 If no scent is chosen, I will send Suede, which is my number 1 seller in scent. Scented Perfume Solid is ready to give a a gift to yourself or someone special. Ingredients: Almond Oil, Mango Butter, Jojoba, Soy Wax, Coconut Oil, Essential Oils or Fragrance Oils. If you are ordering only this solid perfume tin, I will ship via 1st Class mail and refund the difference in shipping.